Is Vertex Pharmaceuticals the Best Biotech Stock? News that could significantly expand sales as soon as next year could propel this company's shares to new highs. Growing demand for its cystic fibrosis drugs suggests Vertex Pharmaceuticals (NASDAQ:VRTX) could be on the cusp of consistent profitability, and if so, then investors might be wise to add it to growth portfolios -- especially now that the company has announced positive late-stage trial results that could significantly expand its addressable market. Cystic fibrosis is a serious, life-shortening disease with few treatment options. Approximately 75,000 people worldwide suffer from it, and most patients succumb to their disease before they reach their 30s. While there's no cure for cystic fibrosis, Vertex Pharmaceuticals is making significant headway in battling it. In 2012, the company launched Kalydeco, a drug that helps clear mucus in the airways of patients with 10 specific mutations,and in 2015, it launched Orkambi, which helps patients with two copies of the F508del mutation in their CFTR gene. These two drugs are a big step forward in the indication; however, there's significantly more work to be done, because combined, these two drugs address only about 29,000 cystic fibrosis patients. But the number of patients Vertex Pharmaceuticals helps may expand soon. After reporting trial results showing that combining Kalydeco with a new drug, tezacaftor, improves lung function in patients, management plans to file for approval of this next-generation drug in the third quarter. In its studies, Kalydeco plus tezacaftor combination therapy significantly outperformed placebo in boosting lung function in patients with two copies of the F508del mutation. It also improved lung function in patients with a mutation that results in residual CFTR function, and one copy of the F508del mutation. If approved, Vertex Pharmaceuticals estimates it will increase its addressable market by about 1,500 patients. More importantly, it believes this two-drug combination can serve as the foundation for an eventual triplet therapy that could expand Vertex Pharmaceuticals' addressable patient population to as many as 68,000 patients someday. Orkambi's launch has put Vertex Pharmaceuticals on a path toward profitability, and an eventual approval of its new cystic fibrosis therapy could accelerate earnings next year. Last year, Vertex Pharmaceuticals sales totaled about $1.7 billion, but operating expenses associated with commercializing its drugs and developing new therapies caused it to lose more than $100 million, on a GAAP-accounting basis. Although the company lost money, it did make significant progress toward turning a profit. The company's GAAP loss was $556 million in 2015. Notably, profit-momentum accelerated into year end, and it should continue in 2017. 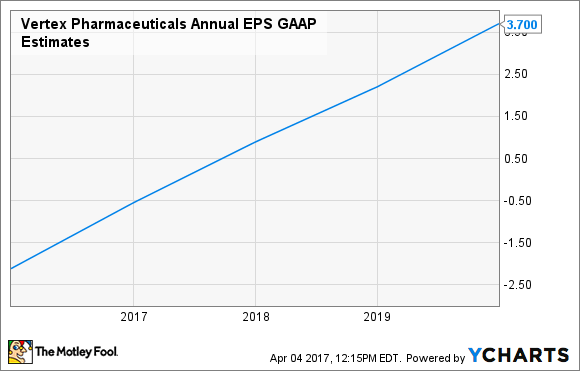 GAAP net earnings were $0.13 in the fourth quarter, compared with a loss of $0.30 per share a year ago, and this year, the company expects sales of at least $1.8 billion and expenses of between $1.55 billion and $1.7 billion, on a GAAP-basis. There's a big unmet need for new cystic fibrosis drugs, and because these drugs are expensive, the launch of a new combination therapy next year that expands Vertex Pharmaceuticals' addressable patient population could provide additional support to margins as sales are leveraged against fixed costs. After digesting the combination therapy data, industry watchers believe the company can be GAAP-profitable this year, and that profit will accelerating through 2019. Obviously, the ability to deliver on that projected growth will depend a great deal on whether the FDA agrees to approve Vertex Pharmaceuticals' new therapy. It will also depend on management's ability to continue innovating to remain ahead of competitors that are also developing new cystic fibrosis drugs. For example, AbbVie is collaborating with Galapagos on cystic fibrosis drugs that it hopes will eventually be best-in-class. Overall, the potential acceleration in sales and profit at Vertex Pharmaceuticals makes it a very intriguing stock to target owning in growth portfolios, and while I don't own it now, it's on my short list of stocks to consider buying this year.